To use the extension, upload the StandardFirmata program to your Arduino board and then open the Arduino extension on ScratchX.org. This Scratch extension lets you interact with the physical world using an Arduino board. For example, you can control lights and motors or measure light and temperature. The extension communicates with an Arduino board running the Firmata firmware. Arduino board with a Grove LED, button, and temperature sensor. We recommend the Grove starter kit for Arduino (made by Seeed Studio). You can buy it from Maker Shed in the U.S. For other options, see working with basic electronic components below. On Windows, it’s probably the highest-numbered COM port. Load the Arduino extension on ScratchX. On FireFox, you might see “Allow scratchx.org to run “Scratch Device?”. Click “Allow…”. You might see another message, “Allow scratchx.org to run plugins?”. Set both Adobe Flash and Scratch Device to “Allow and Remember” and click okay. 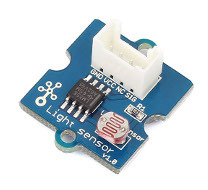 Analog inputs that read from sensors, like the light sensor, temperature sensor, and rotation knob. 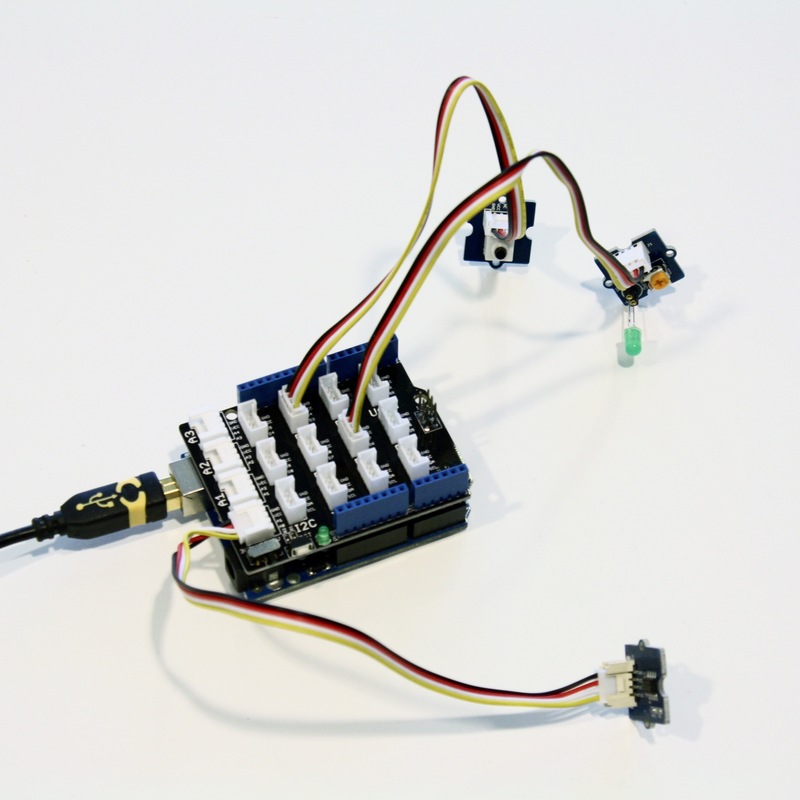 Digital connections that control LEDs and servo motors and read from push buttons. To fade an LED (not just turn it on and off), use D3, D5, or D6. These are more complex connections that we don’t use in the extension yet. To connect a module to the shield, plug one of the Grove cables into the white connector on the module and one of the connectors on the shield. The cable only goes into the connector one way. 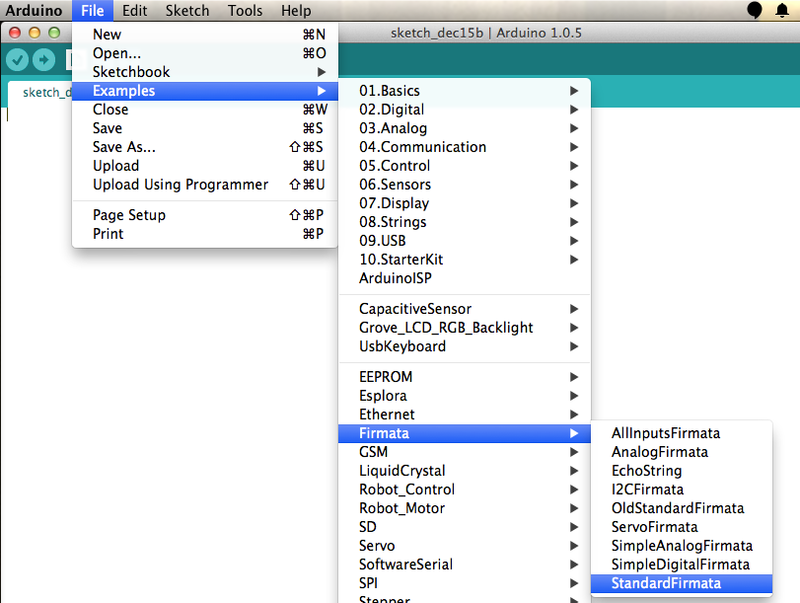 This is a brief description of each of the Scratch blocks included with the Arduino extension. 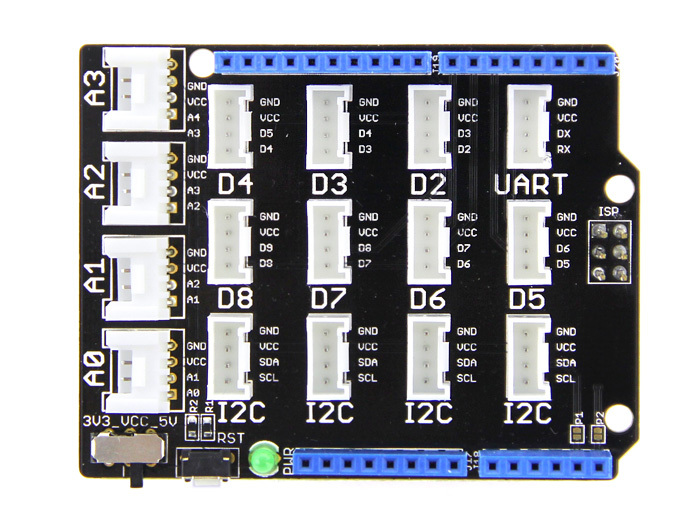 Connects an LED, button, or servo to a digital connection (D2, D3, D4, D5, D6, D7, D8). 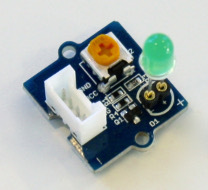 Connects a rotation knob, light sensor, or temperature sensor to an analog connection (A0, A1, A2, A3). Turns an LED on or off. Sets an LED to a specified brightness from 0 – 100%. 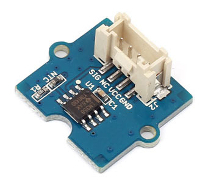 Changes the current LED brightness by a specified amount. 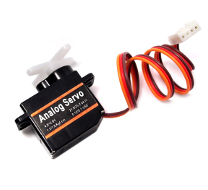 Rotates a servo to a specified location from 0 – 180 degrees. Changes a servo’s current rotation by a specified amount. Runs when a button is pressed or released. Checks if a button is currently pressed. Runs when a rotation knob, light sensor, or temperator sensor meet a certain condition. 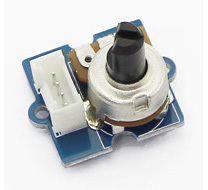 Reads the current value of a rotation knob, light sensor, or temperature sensor. Value will be between 0 – 100. Turns a digital connection (D2, D3, D4, D5, D6, D7, D8) on or off. Sets a capable digital connection (D3, D5, D6) to a value from 0 – 100%. Runs when a digital connection (D2, D3, D4, D5, D6, D7, D8) is turned on or off. Checks if a digital connection (D2, D3, D4, D5, D6, D7, D8) is on or off. Runs when an analog connection (A0, A1, A2, A3) meets a certain condition. Checks the current value of an analog connection (A0, A1, A2, A3). Maps a value between two ranges of numbers. This example might be used to map an analog sensor’s value (0 to 100) to a sprite’s x position (-240 to 240).